The qualifications and status of arts practitioners as professional artists are highly significant in the success of prison arts programmes and their impact on the prisoner participants, according to a new research report publication by Britain’s Arts Alliance. The new study, “Re-imagining Futures: Exploring Arts Interventions and the Process of Desistance” (2013), is part of Arts Alliance’s ongoing research on the impact of the arts on offenders. Jointly funded by the Ministry of Justice and the Monument Trust, Arts Alliance represents more than 470 arts practitioners and organisations working in Britain’s prisons and communities to help offenders lead crime-free lives through creative interventions. The Re-imagining Futures project extends Arts Alliance’s 2011 quantitative study. The previous project statistically detailed the economic impact of arts in criminal justice settings, and found that arts activities significantly reduce re-offending. Building on the quantitative findings, the Re-imagining Futures qualitative researchers observed arts classes, interviewed participants in the classes, and analysed participants’ artwork, written work and class evaluations. 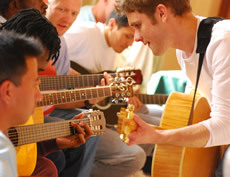 The researchers concluded that “desistance” – the personal growth process through which offenders become non-offenders – occurs in the arts projects. Participants in the study described this growth process. “Indeed, that which I have not felt capable of has now become possible due to my new learning and the advice and support of facilitators/teachers,” one participant said. Tim Robertson, Arts Alliance chair and Koestler Trust CEO, said that research on re-offending typically indicates only if an offender has or has not been caught committing a crime during a specific time period. Nor does it consider the crime’s frequency or severity, or how likely the offender is to perpetrate future crimes. In contrast, “desistance research looks for change on a more profound and permanent level, in which the offender ultimately achieves a new identity ­– a self-hood free from crime,” Robertson said. The Re-imagining Futures researchers examined the experiences of 30 individuals across five projects in four locations: a music and deejaying programme for 13- to 18-year-old medium-to-high-risk offenders; arts classes in a unit for personality disordered offenders in a high security prison; creative writing, bookbinding and paper craft projects at a closed prison for female offenders; and a week-long music creation project in a resettlement prison for adult men. Arts activities help participants begin to redefine their identity, a crucial factor in crime desistance. Arts projects promote high engagement levels with productive activities. Arts projects positively impact people’s ability to cooperate with others, which correlates with increased self-control and better problem-solving skills. Offenders involved with arts projects display increased compliance with criminal justice orders and regimes. Arts projects demonstrate responsiveness to participants’ individual needs. Arts projects offer safe spaces for people to have positive experiences and begin to make individual choices. Robertson said that Arts Alliance’s future goal is to commission the “biggest-ever study” of arts with offenders. This project would examine the arts projects’ social and cultural outcomes in different criminal justice settings, as well as find ways to publicly display participants’ art. Original generation time 1.4306 seconds.